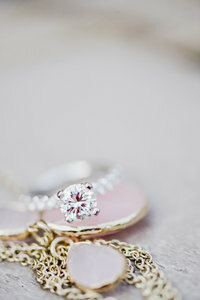 The perfect bridesmaid thank you gift idea photographed by Kari Dawson, top-rated Metro Detroit wedding photographer and provided by Bridesmaids Gifts Boutique. Imagine with me for a second… you have just left your wedding ceremony rehearsal and everyone is gathering, mingling, and cocktailing at your rehearsal dinner. Shiny white boxes trimmed in silver or gold are lined along a table nearby. Each personally monogrammed with the names of your best girls. I have to share with you the perfect bridesmaid thank you gift idea! Inside each box, among white confetti paper, you will find a sparkly tumbler with a personal vinyl monogram on it. You’ll also find a cotton floral bag that contains the sweetest silky cotton floral robe. As a photographer, I eat this kind of thing up! As a woman, I would be so, so excited to unbox this lovely gift set!! In fact, thanks to Bridesmaids Gifts Boutique I actually do have my own. Not only is it perfect for the morning of the wedding while you sip on mimosas, but it’s also perfect for daily use after that. I use my robe while I apply my makeup. And it’s also monogrammed! So fun. If my cup doesn’t have a straw then I don’t get my water in so this cutie has been my go-to since it arrived. There are countless ways and colors to customize each set perfectly for your bride squad. Click the link HERE to see all the options. They arrive in ten days or less when you order. I mean, can you think of a better way to stay cozy and cute with your besties on your wedding day? If you’re looking for wedding reception table gift ideas, check out Forever Wedding Favors. It is a great online shop for wedding favor gifts that your guests will love! View more recent Engagements, CLICK HERE!